Later when we learned how he had formed the Brotherhood of St. Herman of Alaska with Fr. Herman, and they started issuing the magazine The Orthodox Word with the mission and blessing of St. John Maximovitch, and grew in the faith before his eyes, and we learned how they had come here and started this monastery, bringing the water up the hill, and so on, he and Fr. Herman and all the brothers who came to live here became examples for us. Now we can see that he succeeded in dispelling the lie of the spirits of this world and showing that Western society is poisoned with dangerous ideas which from the beginning of the Christian life make it impossible … In his works he succeeded in bringing so clearly to everybody a defense of the truth of our faith and in overcoming that spirit which has caught the majority of people who live here. No one had done this before, especially in regards to evolution—bringing forth the teaching of the Fathers in such detail and making it so clear that people who would read it would not be influenced by this false spirit. After this we felt that it is not enough to paint his icons and to enlighten our minds with his works, but we also needed to receive his blessing, and to ask him to help those who defend the Orthodox faith, and to bring the teaching and words of Fr. Seraphim to all our friends and to all people. I am grateful and thankful that I can come here for the first time to take part in the celebration of these days of the Dormition of the holy Mother of God. I have desired for a long time to come here, to his grave, to see, to touch, and to venerate, and to receive his blessing. May God by His mercies, and I believe by the prayers of Fr. Seraphim, bless all of us, and strengthen us in our struggle to go our way in this temporal world as Fr. Seraphim went, and to receive, as I believe he received, the crown of life. Fr. Hilarion: We are thankful to God that all of you have come to show your love and respect for Fr. Seraphim. We believe that this is a significant event not only for our monastery and for all of us here today, but also for the whole Church, in honoring a righteous man like Fr. Seraphim, who has fought the good fight, and we believe been granted the Kingdom of Heaven. We are giving glory to God and His Church because it is Christ and His Church Who has saved, redeemed, and sanctified Fr. Seraphim and all the saints and righteous ones. May Christ our God send His grace upon our gathering today, and help us along the path that Fr. Seraphim has gone before. Now Fr. Damascene will say a few words. Fr. Damascene: In the name of the Father, Son and Holy Spirit. Amen. Your Eminence, Your Grace, brother clergy, brothers and sisters in Christ, thanks be to God Who has led us to this day. As Abbot Hilarion said, we are blessed to have all of you with us on this very important day in the life of our monastery and in the life of the Church. We’re especially honored to have celebrated the hierarchical Divine Liturgy today with His Eminence Met. Hilarion and His Grace Daniil. This is not the first time that His Eminence Met. Hilarion has visited here—he visited here when Fr. Seraphim was alive. Met. Hilarion was a layman at that time. It’s also not the first time that he’s attended an event in honor of Fr. Seraphim. In the Australian diocese where he’s been the archbishop for many years there have been yearly conferences in honor of Fr. Seraphim to make known and further his spiritual inheritance and His Eminence has attended several of those. We’re deeply grateful that this year you are able to be with us here, Your Eminence, and share your reminiscences of Fr. Seraphim. We’re also very grateful that His Grace Bishop Daniil is with us. He is the vicar of our good friend Met. Joseph who has been here for several anniversaries of Fr. Seraphim’s repose. On the twenty-fifth anniversary he gave a very moving talk in which he spoke on what Fr. Seraphim personally meant to him, and he said that Fr. Seraphim had changed his life through his example of a life wholly given to Christ, and he spoke about how this example was made even stronger by the fact that Fr. Seraphim was not born into an Orthodox family or raised in an Orthodox country. Now, Your Grace, Bp. Daniil as you participate in and further the pastoral labors of Met. 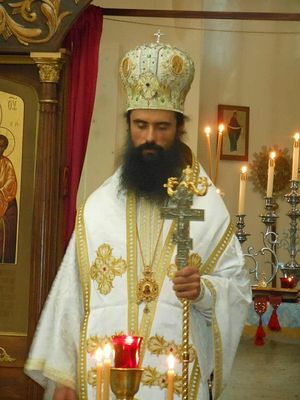 Joseph here in America, both among the Bulgarians and among the new generations of converts, we are very glad that you’ve made this spiritual connection with our monastery on this very important day. For those of you who were not here yesterday morning Bp. Daniil gave a very moving sermon about the meaning of Fr. Seraphim for our times and his message, where he really, as Fr. Seraphim himself would say, “got the point,” bringing home Fr. Seraphim’s message as one who saw the lie of our times, identifying it for us so that we could break free of that lie and see the subtle deceptions that we’re all influenced by, so that we can cling more fully and in a more pure way to the Truth, Which is Christ and His Church. We have also many other old friends and benefactors visiting us. Our dear friend Archimandrite Luka has come all the way from Montenegro, Serbia, where he was the abbot of Sretenje Monastery which is the seat of the ancient metropolitinate of that region, and is now the abbot of two monasteries in Montenegro. He has long been a great venerator of Fr. Seraphim and in the Setenje Monastery he dedicated a kellia in honor of Fr. Seraphim. We discovered, about three years ago, some personal writings of Fr. Seraphim, including a kind of confessional journal from 1974-1976 in which Fr. Seraphim recorded his sinful thoughts and inclinations and spiritual struggles against them. It’s clear from this journal that he kept it in order to help him cut off everything in his life that prevented him from drawing nearer to God. It’s also clear that he did not intend it for publication so I will not share its specific contents here, but there are a few quotes from it in the latest edition of his biography, Fr. Seraphim Rose: His Life and Works. Today I’ll share two of the main things that I learned form what he wrote, which I believe can be of benefit for all of us here as we strive to look deeper into the life of this righteous man of our times, Fr. Seraphim, and to apply the lessons of his life to our own lives as Orthodox Christians. The most obvious thing one takes away is that Fr. Seraphim was unrelenting in his spiritual struggle against sins and passions. He kept a strict watch over himself, scrupulously guarding his purity before God, and being accountable before God for everything. He saw even a brief indulgence in a sinful thought as totally unacceptable, and unworthy of a Christian. He was in a conscious battle to root out evil in himself and draw ever closer to God in love. At the same time, even as he progressed steadily on the path to holiness in Christ he never thought much of himself, but only accused himself. The second thing one notices in his journal is that in writing about how one should undertake the above-mentioned struggle, he often stressed the reading of the writings of the Holy Father together with the Jesus Prayer and other forms of prayer. He wrote about “constant occupation with the Holy Fathers to avoid idleness of mind,” and “waging warfare by filling the mind with the Holy Fathers.” This may seem like rather commonplace advice to himself, but note that he did not just say to himself, “Do more spiritual reading,” but rather to fill his mind specifically with the writings of the Holy Fathers. Books by modern authors who are not Holy Fathers have their place of course and can be of benefit, but Fr. Seraphim, for his own spiritual life, for his survival as an Orthodox Christian, went first of all to the primary sources, to the Fathers themselves. Many times Fr. 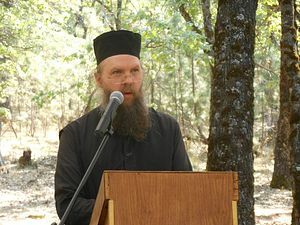 Seraphim spoke and wrote about the need for Orthodox Christians to go to the well-spring of Christian teaching—the Holy Scripture and the Holy Fathers, in order to find the sure guide to true Christianity and salvation. He said we are to come to the Fathers not as scholars or even as mere students, but precisely as disciples—as sons and daughters of the Fathers. In the little journal we see Fr. 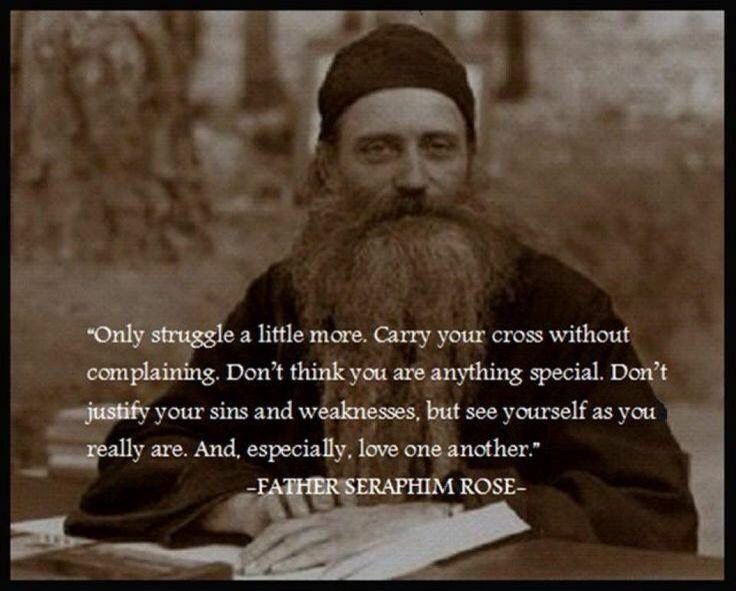 Seraphim applying this advice and counsel to himself. Fr. Seraphim was an ascetic, a podvizhnik. His physical ascetical achievements may not be a source of great wonder when compared to those of earlier times, but considering that he was a twentieth century convert to Orthodoxy, they could indeed be considered remarkable. But Fr. Seraphim was not only an ascetic in body—all asceticism if it is truly Christian is of the whole man—body and soul, mind and heart. Fr. Seraphim, as he wrote in a letter even before coming here, crucified his mind, and gave all of himself over to Christ, bearing his crosses in gratitude and joy so he could be remade into the likeness of Christ, and as he progressed on that path he found the writings of the Holy Fathers not just important, but necessary. In the process of filling himself with the Holy Fathers he developed a very real and deep personal relationship with them. He received the words of life from them. From them he received the mind of the Church, which is the mind of Christ. He prayed to them as living Fathers and was personally coached, nurtured, trained and taught by them. For him the saints were certainly examples to be followed, but much more than that, they were an integral, essential, living part of his daily life. He depended on them, and of all of them there was no one closer to him, no one he depended upon more than a Holy Father he knew both before and after his repose: that is St. John of Shanghai and San Francisco. He wrote in one place that he “expects Vladyka John to tell us what to do.” And as we know from certain miraculous encounters between Fr. Seraphim and Vladyka John after the latter’s repose, St. John fulfilled that expectation. As we ponder why Fr. Seraphim has become so widely loved and revered after his repose, why his writings have had such a profoundly positive impact on the Orthodox Church worldwide, although he was a mere modern American and a Californian nonetheless, I think that we have a key to the answer to that question just in his above-mentioned spiritual journal. Fr. Seraphim’s writings came out of his life. His authentic presentation of Patristic teaching to modern man was borne out of his own ascetic struggle against the passions. He was uncompromising with himself in his own spiritual life and he was uncompromising at the same time in his adherence to the Orthodox Patristic teaching, never watering it down to make it palatable to the modern mentality. Fr. Seraphim never published anything about his own personal spiritual struggle, but his printed words covering a multitude of topics, which touch the lives of people every day, breathe that struggle. Souls searching for the unadulterated truth of Christ in our Church sense in Fr. Seraphim one who did fight the good fight and who finished victorious by Christ’s grace. One may then ask: in Fr. Seraphim’s relationship with the Fathers, in his filling his mind with them and becoming their disciples, did he in the end become one with them and thus one of them? Each person can answer this question for himself and one day, if it be God’s will, the Church as a whole will decide. But for myself, as one who knew Fr. Seraphim personally, for a time that seemed all too brief but for which I’m deeply grateful to God, and as one who has studied his life and wirings for many years, both published and personal, I would say the answer is “yes.” As Bp. Nektary of Seattle of blessed memory, one of Fr. Seraphim’s father confessors, said at his funeral, we can now seek Fr. Seraphim’s help from Heaven just as Fr. Seraphim sought the help of so many Holy Fathers before him and above all, Vladyka John. In today’s Epistle which we read by God’s providence at Fr. Seraphim’s grave we heard words that really struck me as coming from Fr. Seraphim to us—words of St. Paul. 1 Cor. 16: Watch ye, stand fast in the faith, act like men, be strong. This is something that we know Fr. Seraphim did and something that he always taught—stand and watch the signs of the times. It’s later than you think. Stand fast in the faith and don’t let anything swerve you away from the true faith that Christ has given us in His Church and be strong in Christ. The next phrase is Let all your things be done with charity and Fr. Seraphim did this. He spoke the truth, he helped people to stand fast in the faith, and he did everything in charity and as he grew in charity and love in his life as an Orthodox Christian, and especially as a pastor, that love comes through even more strongly. St. Paul finishes: If any man love not the Lord Jesus Christ let him be anathema. Maranatha. Fr. Seraphim was very bold in this, as His Grace Bp. Daniil mentioned yesterday, uncovering the lie of our modern times, showing us that the belief that we imbibe with our times, this worldview and way of thinking, is neither of Christ nor does it come from those who love Christ. It comes from the evil one and fallen man. Fr. Seraphim asked us to be aware of these things so that we could make a break and truly have the mind of Christ. Anathema means cut off, and in Fr. Seraphim’s life and teaching he taught us how to do that cutting off. The grace of our Lord Jesus Christ be with you. My love be with you all in Christ Jesus. Amen. I believe that we all came to show our love for Fr. Seraphim, coming to his grave, praying for him, honoring his memory, and at the same time he’s showing his love for us. He’s shown his love for us during the whole history of our brotherhood, with the tough times. By the prayers of St. Herman, Vladyka John, Fr. Seraphim, and the Most Holy Theotokos and all the saints we have been delivered from all kinds of temptations and trials and God has brought us to this day. We feel Fr. Seraphim’s love very deeply for us in this monastery and we believe that Fr. Seraphim has this love for all of us. During his lifetime he was so concerned to bring his fellow man to the true Church and after his repose through his prayers many have come to the Church, and he is expressing and showing that love today, and the grace that we experienced from God on this day comes in part through Fr. Seraphim’s prayers for us. He is saying to us “my love be with you all.” This love is not simply Fr. Seraphim’s but his love and the grace he gives is the love of Christ that comes through Fr. Seraphim, as from all the saints. Today as we celebrate Fr. Seraphim’s memory may we truly appreciate the gifts that Christ has given to us through Fr. Seraphim, and at the same time truly appreciate the love of Christ for us and the love of His humble servant Fr. Seraphim for us. Amen.